Oatmella™ is a rich therapeutic Melaleuca shampoo. Great for rain rot, girth itch and other skin conditions. 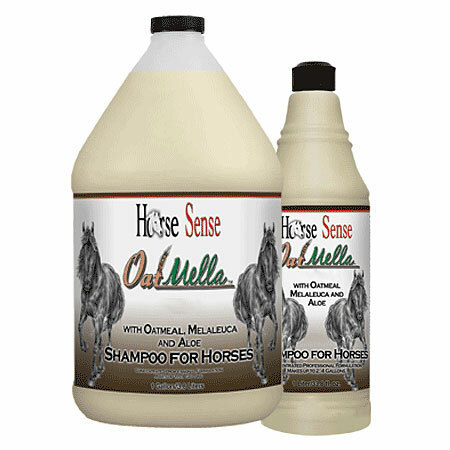 HORSE SENSE OATMELLA™ Professional Shampoo combines the traditional healing properties of Oatmeal, Melaleuca (tea tree oil) and Aloe in a rich, therapeutic shampoo for a natural skin-soothing treatment. Melaleuca is widely recognized as a natural fungicide and disinfectant effective in dealing with rain rot, girth itch and hot spots. The colloidal oatmeal exfoliates dry flaky skin cells and soothes underlying tissue. The unique formula helps to eliminate odors often associated with skin irritations. Also great for dogs, cats, cattle and most other animals.